Copper Kettle Cinnamon Caramel Corn, with real butter. Sinfully cinnamon. 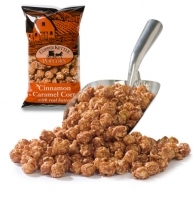 Our caramel corn starts with Indiana grown popcorn, then we add our specialty old-fashioned recipes of caramel to produce a true caramel corn treat. Each bag is 8 oz.